Born in Boston, Massachusetts, Gail spent her formative years in New York state with an avid interest in art since her teen years at Munson-Williams-Proctor Arts Institute in Utica NY. She attended Boston University, and later moved to Canada to take art courses at Toronto's Central Technical School and Ontario College of Art in preparation for admission into University of Toronto's Medical Illustration Degree Program. Marriage altered her plans in Toronto and brought Gail and her husband to Vancouver Island, BC, where she furthered her art education at Malaspina University College in Nanaimo. Although she continued drawing and painting, her main focus became the establishment of a successful organic farm and market business. With the sale of the family business in 200l, and her two children grown, Gail returned to her first passion and has been painting full time since. Gail works mainly in acrylics and oils on canvas, as well as watercolor and pastels. Confident stroke and bold, colour saturated palette often define her acrylics and oils, whereas her work in pastels is mostly represented in large sensitively rendered life drawings. Gail paints intuitively, often referencing imagery inspired by her farming life, her proximity to Vancouver Island's impressive coastline, her favourite fly fishing locations, and her love for all things growing. "I feel privileged to have so much to paint - such beauty and rich, grounded experiences to draw from. I follow my brush . . . and taste the colour." 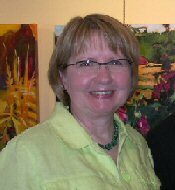 A member of the Federation of Canadian Artists, Gail achieved AFCA signature status in March 2006. Her work has been in numerous group exhibitions and solo shows in British Columbia and Alberta, and can be found in private collections throughout North America.